The calculator manufacturer steps further into the tablet business. Without a doubt, Texas Instruments is best known for its advanced calculators. They are also the third largest semiconductor manufacturer after Intel and Samsung. In the tech industry, they are better known for their ARM chips, some of which are found in today's smartphones and tablets. 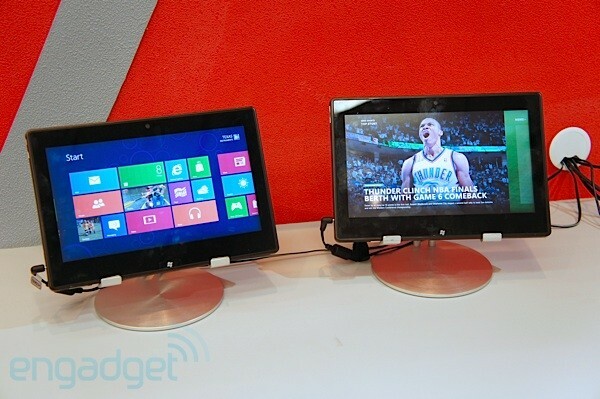 In Computex 2012, Texas Instruments has powered another device on a floor full of Windows RT tablets. The test tablet is powered by TI's OMAP 4470 dual-core processor with 1.5 GHz clock speed. A PowerVR SGX544 runs dual-channel memory graphics processing into the chip. Toshiba has partnered with Texas Instruments with its upcoming Windows RT tablets. The tablet pictured below is a beta version - it was clearly missing a manufacturer logo. Since both Windows 8 and RT are still in developmental stages, Toshiba was in no rush to release a branded tablet for Computex this year. Other well-known low-powered processors include Intel Atom and Core ULV, NVIDIA Tegra, and Qualcomm Snapdragon. A nameless tablet in Computex.